Bit of a story first to explain. Then the question. Sorry for the length, but I'm not even sure how to really ask. I have a toddler (3 years old) that is showing a strong interest in music, so I decided that I would pick up a "cheap" keyboard and learn to play it properly. In the mean time I already know how to play it "improperly" so I can play small pieces like Twinkle Twinkle etc. And he can see it, and more importantly interact with it by pressing buttons and hearing sounds and listening to some important things (for example these two keys together sound good, and these two sound bad). All in all a good way for him to see, and touch music in the house, that later we can turn into lessons, but for now can give him a place to explore. For my self, I used to play Trumpet quite well, I enjoyed it, and did several performances before I started to get serious about my business. Still I practice, though more as a hobby, and I have tried to find a way "play" more music but without the need to practice in an ensemble (for example) so that I can have my cake and eat it too. Several years ago, I decided to learn keyboard because you can play quite a few pieces on keyboard, and there is always the opportunity to preform at a social gathering of nearly any kind. And while I made an honest effort at it, the method I chose really sucked. I don't want to get into a lot of detail here, but while I know where "Middle C" is and so on, music reading was not part (I could already read, so I didn't think I needed a strong focus on that) and left hand play is extremely weak. Chords and what not, were also non-existent. I realized that I was not really getting anywhere with that so I sold the keyboard (It was actually a very good, and sadly expensive instrument) and stuck with the Trumpet. This time around however I am trying to learn [more] properly. I have picked up a method book, and I am doing all the exercises, including "learning to read" but there in lies the core of my problem. I can quickly dismiss the years of "messing around" with the old keyboard lessons, because I know they are not correct. This time, I know, and can therefore stay focused on facts like the "old way" never focused on things like finger positioning, but that it's important so pay attention. But I have a hard time, not focusing on core music principals that I did learn properly and have been practicing for years. As an example, one of the early excersizes has you play a chord, containing a C, D, G on the left hand while playing notes, C, E, G on the right hand one after another. While I know this is to help with finer positioning, and independence, whenever I play it my brain auto flips out and I go from focusing on correct playing to "what did I do wrong". Again, sorry that took so long. I do want to learn to play this new instrument, but I keep running into this clash (in several areas, for example I can read both clefs but I read the Trouble clef much stronger, so I have a tendency to "blow though" right hand work, while struggling in left hand work, for no other reason then I have to sit there and go "That is a C not an A"
How can I focus on learning, like a new student, given that I am not exactly new, but I do need to focus on some areas where I am just like, or worse then, a new student? Focus on the basics. You're already coming to that conclusion but you really need to take a strong look at yourself and how you practice. You say your left hand is weak, so practice with only your left hand and the bass clef for awhile. Play up and down the white keys, then the black keys, then chromatically. Do the same for your right hand then combine them. One thing I love to do doesn't even involve playing; take a pencil and some paper and write down the notes, the keys, the fingerings, anything you're studying. I think this is a mistake in your thinking that's also holding you back. All of the intervals on a keyboard are used between every key. Even though fifths and octaves are more "consonant" in general, there are always situations where dissonance is called for, and even where consonant intervals are combined with dissonant intervals. The exercise is trying to teach you that. If all you do is play normal triad major chords all day your work will sound boring, so most composers write in inversions or suspensions to make it more interesting. I think one of the biggest ways you can improve your reading is to look at each note not as a single note that has one position (like you would on trumpet) but as a note in comparison to those around it. Don't read the notes, read and hear the intervals. Since you'll often have to change positions it is advantageous to know your intervals and what intervals lead to the notes around your current position. This is a big change from trumpet which has basically only one hand position. Not the answer you're looking for? Browse other questions tagged keyboard self-learning or ask your own question. How does the song feature work on the Casio CTK keyboards? How to know which fingers to use to play songs? How to learn piano with MIDI files and a keyboard? 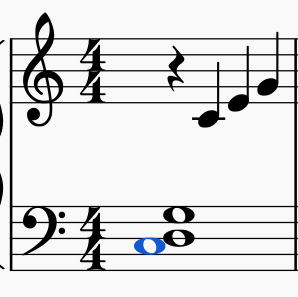 How can I determine which chord to play? I have a non weighted keyboard, and can't buy a new one. Can I still learn piano using it? What musical/piano skills can be developed when practicing in a 25 keys keyboard? How does a keyboardist (as the lead singer) display good, energetic stage presence?